With many governments still failing to acknowledge it, including those in Dublin and London, we present a brief history of the Armenian genocide, one hundred years ago today. In 1915, leaders of the Turkish government set in motion a plan to expel and massacre Armenians living in the Ottoman Empire. Though reports vary, most sources agree that there were about 2 million Armenians in the Ottoman Empire at the time of the massacre. By the early 1920s, when the massacres and deportations finally ended, some 1.5 million of Turkey’s Armenians were dead, with many more forcibly removed from the country. Today, most historians call this event a genocide -- a premeditated and systematic campaign to exterminate an entire people. However, the Turkish government does not acknowledge the enormity or scope of these events. Despite pressure from Armenians and social justice advocates throughout the world, it is still illegal in Turkey to talk about what happened to Armenians during this era. The Armenian people have made their home in the Caucasus region of Eurasia for some 3,000 years. For some of that time, the kingdom of Armenia was an independent entity-at the beginning of the 4th century AD, for instance, it became the first nation in the world to make Christianity its official religion-but for the most part, control of the region shifted from one empire to another. During the 15th century, Armenia was absorbed into the mighty Ottoman Empire. The Ottoman rulers, like most of their subjects, were Muslim. They permitted religious minorities like the Armenians to maintain some autonomy, but they also subjected Armenians, who they viewed as “infidels,” to unequal and unjust treatment. Christians had to pay higher taxes than Muslims, for example, and they had very few political and legal rights. In spite of these obstacles, the Armenian community thrived under Ottoman rule. They tended to be better educated and wealthier than their Turkish neighbors, who in turn tended to resent their success. This resentment was compounded by suspicions that the Christian Armenians would be more loyal to Christian governments (that of the Russians, for example, who shared an unstable border with Turkey) than they were to the Ottoman caliphate. Between 1894 and 1896, this “box on the ear” took the form of a state-sanctioned pogrom. In response to large scale protests by Armenians, Turkish military officials, soldiers and ordinary men sacked Armenian villages and cities and massacred their citizens. 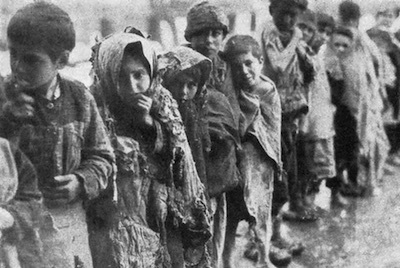 Hundreds of thousands of Armenians were murdered. In 1914, the Turks entered World War I on the side of Germany and the Austro-Hungarian Empire. (At the same time, Ottoman religious authorities declared jihad, or holy war, against all Christians except their allies.) Military leaders began to argue that the Armenians were traitors: If they thought they could win independence if the Allies were victorious, this argument went, the Armenians would be eager to fight for the enemy. As the war intensified, Armenians organized volunteer battalions to help the Russian army fight against the Turks in the Caucasus region. These events, and general Turkish suspicion of the Armenian people, led the Turkish government to push for the “removal” of the Armenians from the war zones along the Eastern Front. On April 24, 1915, the Armenian genocide began. That day, the Turkish government arrested and executed several hundred Armenian intellectuals. After that, ordinary Armenians were turned out of their homes and sent on death marches through the Mesopotamian desert without food or water. Frequently, the marchers were stripped naked and forced to walk under the scorching sun until they dropped dead. People who stopped to rest were shot. Records show that during this “Turkification”campaign government squads also kidnapped children, converted them to Islam and gave them to Turkish families. In some places, they raped women and forced them to join Turkish “harems” or serve as slaves. Muslim families moved into the homes of deported Armenians and seized their property. In 1922, when the genocide was over, there were just 388,000 Armenians remaining in the Ottoman Empire. After the Ottomans surrendered in 1918, the leaders of the Young Turks fled to Germany, which promised not to prosecute them for the genocide. (However, a group of Armenian nationalists devised a plan, known as Operation Nemesis, to track down and assassinate the leaders of the genocide.) Ever since then, the Turkish government has denied that a genocide took place. The Armenians were an enemy force, they argue, and their slaughter was a necessary war measure. Today, Turkey is an important ally of the U.S. and other Western nations, and so their governments have likewise been reluctant to condemn the long-ago killings. In March 2010, a U.S. Congressional panel at last voted to recognize the genocide.